The Marine Mammal Center : Faith - First "Ellie" of 2012! Faith - First "Ellie" of 2012! Faith is the Center's first elephant seal patient of 2012. Faith takes one last look back before heading into the ocean. His right eye was injured when rescuers found him but over time will heal fine in the salty water. Faith is now back in the wild along with his other buddies from the Center inlcuding Theros! The pinnipeds were greeted by some other elephant seals that were lounging in the waves at Point Reyes on May 13, 2012. Great news today - Faith is eating solid fish on her own! Faith, the first elephant seal pup admitted in 2012, rests at The Marine Mammal Center. Here, you can see how he is molting his "black coat" which will then be replaced with a sleek gray one. Pupping season - the time of year when Northern elephant seal and harbor seal pups are born along the CA coast - has officially begun! On February 15, our volunteers came to the rescue of an abandoned and malnourished black coat (term that means an elephant seal that is less than 6 weeks old and still has his original birth "coat") at Lawson's Landing in northern Marin County. The young pup was named "Faith" at the rescue site, but upon examination - Faith turns out to really be a male who weighs 34kg (a little over 74 lb) and is alert and very vocal! In addition to being underweight (elephant seal pups can gain as much as 10 lb a day while weaning) he has an injury to his right eye. Veterinarians tube feed electrolytes to Faith to keep her hydrated. 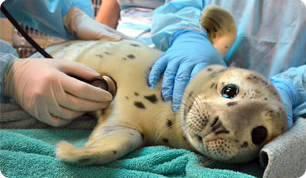 Veterinarians have started the little guy on electrolytes and will soon begin the process of tube-feeding him a milkshake-like formula made of ground herring and water. Once he's stronger, they will offer him whole fish and get him nice and fat and ready to return to the wild.